Dragonfly sport bras are designed for hot yoga styles such as bikram yoga. However, they are used a lot for pole dancing. So you can be sure that these yoga bra tops stay perfectly in place during your yoga practice. Dragonfly sport bras are designed for hot yoga styles such as bikram yoga. However, they are used a lot for pole dancing. So you can be sure that these yoga bra tops stay perfectly in place during your yoga practice. It doesn't matter how you stretch, bend or twist in the yoga postures, Dragonfly will cover you. Dragonfly Brand yoga sport bras are made of high quality fabric with 4-way stretch that feels like a second skin because of the peach fuzz feeling on the inside. 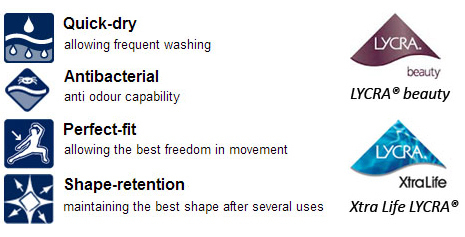 It wicks away moisture immediately and is anti-bacterial, for anti odour capability. In addition, it dries quickly and keeps its shape with frequent washing. Ideal if you're like to wear your favorite yoga sport bra quickly again in your next yoga session. Dragonfly is made entirely in the E.U. (Czech Republic) and is available for a very friendly price. Especially when you consider the high the quality. Try Dragonfly Brand yourself to experience the comfort of these yoga clothes.